To help achieve Power Plan targets, the Executive Committee of the Northwest Energy Efficiency Taskforce (NEET) recommended in 2009 that BPA and NEEA enhance coordination on emerging technology research. This request has resulted in two robust & complementary initiatives that help "fill the pipeline" of products and services for implementation in utility EE programs. One of these is collaboration through the BPA Energy Efficiency Emerging Technology (E3T) group and the E3T Northwest database (http://e3tnw.org/). The other is EE technology roadmapping (http://www.bpa.gov/energy/n/emerging_technology/). Industries and organizations in a wide array of sectors create technology roadmaps to support research and development (R&D) plans that meet strategic goals. BPA has facilitated the development of energy efficiency technology roadmaps for the region that provide collective snapshots of experts’ current knowledge and research priorities. 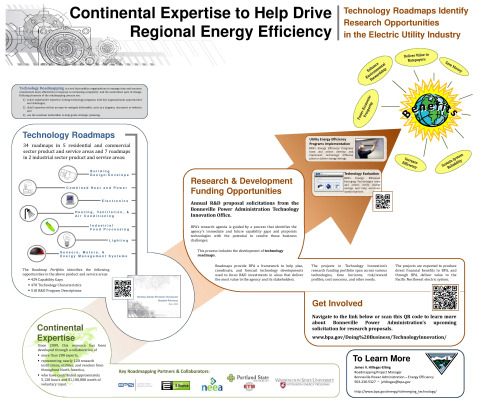 This resource is titled the National Energy Efficiency Technology Roadmap Portfolio and it draws upon subject matter expertise from across North America representing public and private utilities, national laboratories, research universities, vendors, entrepreneurs, and others to develop a vision for delivering energy-efficient products and services to the marketplace up to five, ten, and even twenty years into the future. Collaboration is the cornerstone of the Pacific Northwest’s approach to roadmapping. At every stage BPA and its partners have actively sought and fully integrated data and feedback. The Roadmap Portfolio is designed to be a living, working reference document because regular updates and refinements are an essential part of the process of maintaining its value. This document currently identifies more than 400 Capability Gaps, nearly 500 Technology Characteristics, and more than 500 R&D Program Descriptions. The EE Technology Roadmapping group on Conduit will serve as a forum for sending announcements, updates, event notifications, and related information of relevance to the Roadmap Portfolio specifically and more broadly to EE technology R&D tracking, investment, collaboration, and related topics.